For the young Émile Bernard, aged nineteen, 1887 was a year of achievements. Bernard and his friends made the most of their conversations and of the new expressive modes they discovered together. Thus, Émile Bernard and Louis Anquetin rejected pointillism, which they had practised in 1886, and adopted cloisonnism. They shared Van Gogh's enthusiasm for Japanese prints and produced very avant-garde paintings. 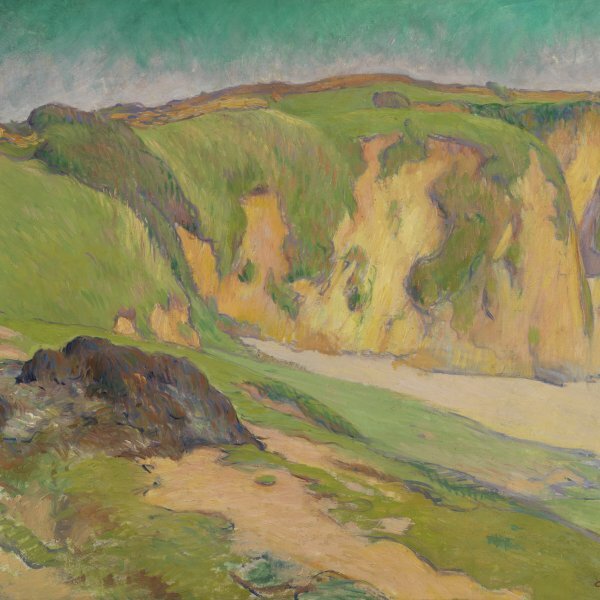 During the summer of 1887, Bernard stayed at Saint-Briac, on the north coast of Bretagne, and then at Pont-Aven, on the south coast, in the absence of Gauguin, who was in Martinique. He painted this picture in Pont-Aven. The general style is cloisonnist, with marked outlines, light colours applied with wide, uniform brushstrokes, but it is still reminiscent of pointillism in the face of the Breton woman on the left. Bernard adopted a more radical synthetism after 1888, while this painting shows still an intermediate technique. The subject is dealt with in the style of Japanese prints: the figures are not centred and are cut, there is an absence of perspective which flattens the image and the audacious motif of the wheel takes up half the space of the composition. 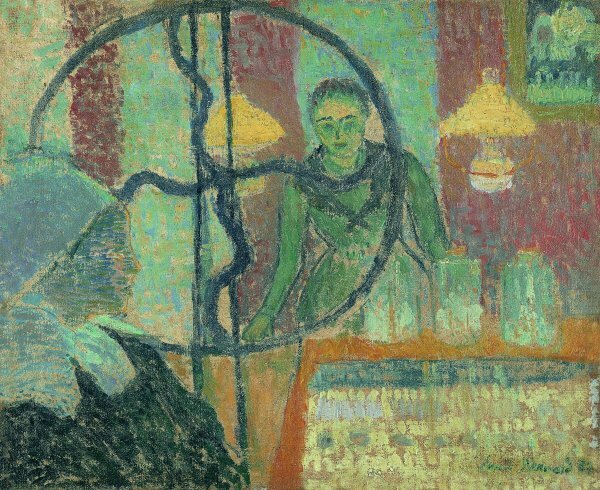 The scene represents the inside of a grocer's shop with, at the back, the shopkeeper behind the counter, her face framed by two petrol lamps. On the counter three jars with sweets stand in a line. On the left, in profile, there is a woman with the bonnet and collar typical of Pont-Aven, waiting to be served. The large wheel is a cast iron wheel with typical curved spokes, used to operate a belt, undoubtedly for the maintenance of the goods stocked in the cellar. This large circular shape gives an esoteric atmosphere to the scene; in fact it is used with this aim by Émile Bernard, who experiments with pictorial symbolism. The scene is mute, the two women are not looking at each other, which adds mystery to the subject. At the top, on the right, a mirror reflects the inside of the shop, with a suspended petrol lamp and the outline of a woman. At the time, all grocers also served drinks, and one can feel in this composition the atmosphere of a bar in the style of Toulouse-Lautrec. (Lautrec painted Bernard's portrait that same year). This painting has been entitled The Spinning-Wheel due to a lack of knowledge of the subject; a spinning-wheel could never be so large and have such a diameter. In any case, spinning was only done at home, and never in a public place. 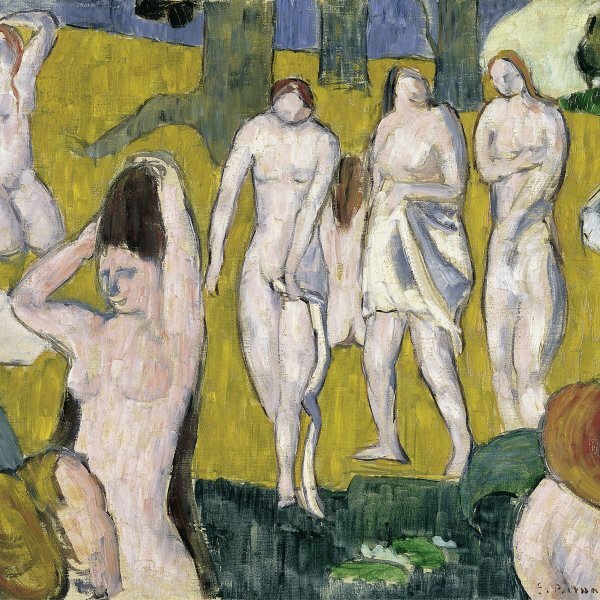 Émile Bernard painted an audacious work in its composition, inspired by everyday life in Pont-Aven. It testifies to his artistic experiments in that transition year of 1887.